This poster was at the Kotobukiya booth over at SDCC 09 about a month and a half back. just wanted to pay homage to Shunya Yamashita and his amazing work so far with Marvel. The Rogue figure recently arrived and it looks great. (kept one for myself ^^) Of course the news that happened earlier this week was that Marvel was bought out by, of all companies, Disney 0-O. As long as Disney keeps everything basically the way they were, Marvel will do just fine. Hopefully things don't go down the watered down kiddy route for Marvel. If that happens, chances are Yamashita won't be designing Bishoujo too much longer :-( It's very obvious that Yamashita with Kotobukiya (and sculptor Koei Matsumoto) make very gorgeous versions of American comic book girls. 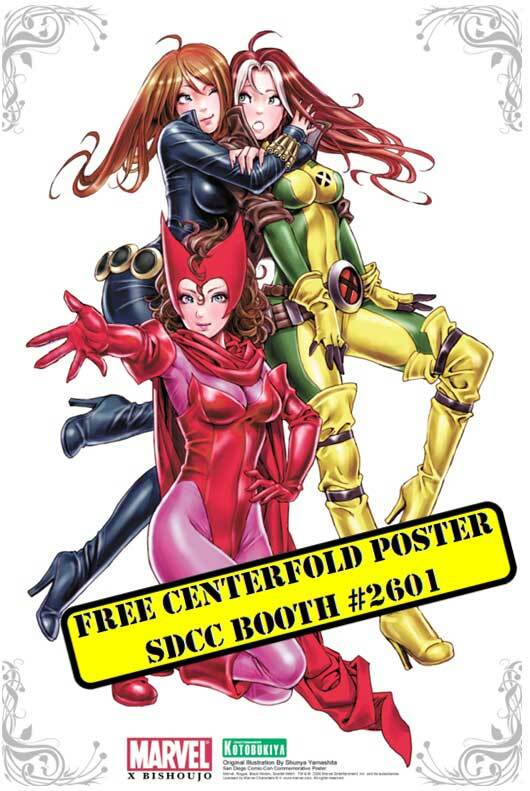 Sadly, the comic book girl figures developed here in the US tend to look like, well...very manly women 0_O, so please Disney...don't drop the deal with Yamashita and Kotobukiya.